Commentary: Selling Coca-Cola and Saving Newborn Lives? This article was originally published on Degrees LIVE. TO ACHIEVE MILLENNIUM DEVELOPMENT GOAL 4 (MDG 4), we need to prevent the deaths of an additional 1.5 million newborns by December 31st, 2015. At the current rate of progress we won’t get there. Rates of reduction in newborn deaths need to be four times faster to achieve MDG4. And with newborn deaths at 44% of all under 5 deaths, how to save newborn lives quickly has become the most critical child survival challenge in the 800 days left to the MDG4 deadline. 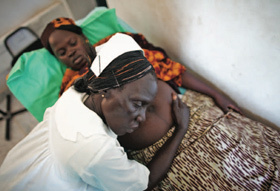 Given the concentrations of newborn deaths in just a handful of countries – India, Nigeria, Pakistan, China and the Democratic Republic of Congo – and the strong relationship between levels of maternal education and reductions in child mortality – one approach is to design and execute a series of education and behavior change campaigns focused on improving homecare of newborns. But not just any education and behavior change campaigns – campaigns designed and executed by the top creative teams at the world’s leading advertising agencies. The same people who make sure that Coca-Cola is available no matter where you go in Africa and South Asia. The same people who make sure every teenager in the remotest communities craves a certain sporting shoe. The same people who make sure that every adult in the most desperate slums strives for that particular smart phone. Just think what these people could do if they applied their considerable talents to changing the behaviors of new mothers most at risk of losing a newborn. Imagine a series of state of the art campaigns that focused on the three or four behaviors that dramatically reduce the risks to newborns – early and exclusive breastfeeding, how to recognize the dangers signs of a sick newborn and know what to do, how to keep a newborn warm and critically, what not to do – early bathing, exposure to the elements, applying harmful substances etc. Imagine campaigns that created a powerful emotional connection between new mothers and these new behaviors and actually empowered mothers to both provide and demand better care for their newborns, through the use of incentives like cash payments and other rewards. Imagine campaigns that reached mothers directly, through all of the communication channels they prefer and have ready access to – village groups, television, radio, mobile phones – at the most critical times including the months prior to birth and the week after birth when newborns are at greatest risk of death. Where advertising agencies have been engaged in public health challenges the results have been impressive. Cigarette use has dropped, road safety has increased, more condoms have been used, nutrition and levels of physical activity have improved, and contraceptive use, screening for cervical and breast cancers and vaccination rates have all risen. Strong results have also been recorded for campaigns to increase the use of insecticide-treated bed nets in Africa, and breastfeeding rates and the use of oral rehydration salts and zinc across South Asia. One of the most impressive recent efforts is McCann Health’s “Dumb Ways to Die” campaign for the Melbourne train authority. Rather than a typically earnest public service announcement, McCann opted for a mix of offbeat humor, a catchy tune and a collection of amiable animated characters to launch the message as an online music video under the irreverent title “Dumb Ways to Die”. The video has now amassed close to 57 million views and 3.8 million shares. More importantly, 39% of the target audience has stated that they would be safer around trains because of the campaign, and the Melbourne train authority recorded a 21% reduction in accidents and deaths on its network. 3. “Real Beauty Sketches” to improve women’s body image and confidence, sponsored by Dove. We need leading corporations to join forces with ad agencies to drive newborn health messages direct to mothers and families in the countries with the greatest newborn challenges. Corporations are already investing huge sums in advertising their own brands in an effort for build market share all over Africa and South Asia. Why not do so in a way that advances newborn health where the connection with company’s core business is clear? The stakes are high. If we don’t do this, the massive global effort underway to increase the supply of quality, affordable newborn health products may fail. The UN Commission on Life-Saving Commodities for Women and Children has prioritized 13 commodities for accelerated introduction in the counties where maternal and child deaths are concentrated. In the newborn area the target products are chlorhexidine, newborn resuscitation devices, injectable antibiotics and antenatal steroids. But this effort won’t yield strong results if mothers and health care providers are unaware of these products and don’t understand the connection between their own behaviors and newborn deaths. The approaches that are used by advertising agencies to successfully stimulate demand for product brands like Coca-Cola in developed markets are not so different to those that can be used to transform unhealthy behaviors into healthy ones in rural villages across Africa and South Asia. Turns out that selling Coca-Cola and saving newborn lives might not be such different challenges, and if we could get the kind of results in newborn health that Coca-Cola has achieved in some of the hardest to reach communities in the world, we would be a long way to closing the MDG4 achievement gap.